Inglewood Park Cemetery, Inglewood, California, U.S.
Thomas J. 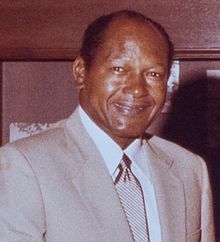 "Tom" Bradley (December 29, 1917 – September 29, 1998) was an American politician. He was the 38th Mayor of Los Angeles. He served from 1973 to 1993. He was the only African-American mayor of that city. His 20 years in office mark the longest time by any mayor in the city's history. He became mayor after an election in 1973. It made him the second African-American mayor of a major U.S. city. Bradley retired in 1993. His approval ratings had begun dropping because of the 1992 Los Angeles Riots. Bradley ran for Governor of California in 1982 and 1986. He was defeated each time by the Republican George Deukmejian. In 1985, he was awarded the Spingarn Medal from the NAACP. Bradley died on September 29, 1998 in Los Angeles. He died from a stroke caused by a heart attack. He was aged 80. This page was last changed on 3 July 2018, at 07:18.